Patna 21/2/2011: A National Seminar was organized jointly by A N Sinha Institute of Social Studies (ANSISS), Patna, INSAF and Citizen’s Forum for Civil Liberties, New Delhi on “Idea of Unique Identification (UID) Number/ Aadhaar Project” on 21st Feb 2011 at ANSISS, Patna. The chief guest Dr. Usha Ramanathan noted Jurist of Supreme Court, emphasized on the concept of UIDAI. The Unique Identification Authority of India is an agency of the Government of India responsible for implementing the envisioned Multipurpose National Identity Card or Unique Identification card (UID Card) project in India. It was established in February 2009, and will own and operate the Unique Identification Number database. The authority will aim at providing a unique number to all Indians. The authority would provide a database of residents containing very simple data in biometrics. The Seminar will deliberate on Bihar Government’s agreement with UIDAI which was signed on 20 August 2010 along with related issues. The Parliamentary Standing Committee on the Finance got a ‘Preliminary briefing by the representatives of the Ministry of Planning / Unique Identification Authority of India (UIDAI) on the `National Identification Authority of India (NIAI) Bill, 2010' on 11th February, 2011 for the second time. So far UIDAI has failed to satisfy the Parliamentary Committee. New Delhi, 16/2/2011: If tagging of Indian students with Radio Collar in US is deemed an assault on human rights and is deemed offensive, which it indeed it is, how are proposals of Sam Pitroda, Adviser to the Prime Minister on Public Information Infrastructure & Innovations and Nandan Nilekani's UID Number/Aadhaar project that intends to tag all Indian residents acceptable? Both Pitroda and Nilekani work from the premises of Planning Commission of India. In a statement on the matter of Tri-Valley University scam released to media dated 12th February, S.M. Krishna, Union External Affairs Minister, Government of India said, "You will be happy to know that radio tagging has been removed from some students and other cases are being actively pursued." 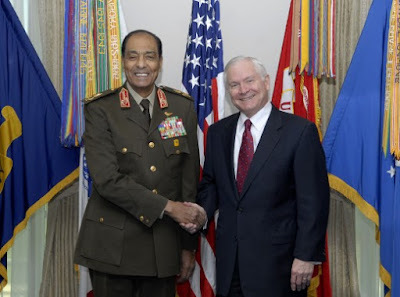 Gates has said that Egypt's military had "made a contribution to the evolution of democracy.". Tantawi has served in the 1956 Suez Crisis and in both the 1967 and 1973 Middle East wars. USA provides about $1.3 billion in military aid to Egypt each year. As change sweeps Egypt and becomes imminent in Arab political life, Marwan Bishara, Al Jazeera's senior political analyst, evaluates the speed and efficacy of the transition to democracy. What are the chances that the transition could still go wrong in Egypt? New decisions of the supreme military council such as dissolving the country's unrepresentative parliament that came after rigged elections, bodes well for the dismantlement of the old regime and erecting a new one. However, the military's insistence to keep the Mubarak appointed Ahmad Shafiq government for the transitional period has raised concern. Likewise, freezing the constitution is a double edge sword. While it allows for writing a new more democratic constitution, it could also enable the military leaders to act according to its own interest, rather than the interest of the revolution. Government was faced with another suspected scam which can cost the exchequer upto Rs two lakh crore concerning a deal between ISRO and a private company and in a quick response it was announced that the pact was under review. After a news report this morning that ISRO's commercial arm -- Antrix Corporation -- has entered into a deal with Devas Multimedia Services that allegedly confers unbridled use of 70 MHz of scarce S-band spectrum over a 20 year-period, the Department of Space came out with a late night statement. "The Department (of Space) wishes to clarify that the Agreement entered into by Antrix, the commercial arm of ISRO, and M/s. Devas on January 28, 2005 is already under review by the DoS and the government will take whatever steps are necessary to safeguard public interest. A decision on the matter is likely to be taken soon," it said. Devas is owned by M G Chandrasekhar, former Scientific Secretary, ISRO. Industrialist and MP Rahul Bajaj today added a new dimension to the debate over black money, saying it funds political parties. "Where does the political party gets its funds from? Comm on, I've been in Parliament for four years. Its not cheques, its not by small members. All money comes in through black money. Black money doesn't come from heaven," Bajaj Auto Chairman said addressing a CII conference here. However, he maintained that the Bajaj family does not fund parties in cash and pays only through cheques to ensure accountability. He further hinted that promoters of companies also indulge in diverting some of the company's money illegally turning it into black money in the economy. "Corporates do take it out from the company. Most of us know some of the ways of taking that money out ... taking out black money from a company is cheating minority shareholders," he said. Politics of black money: Can FM rework tax treaties? The Finance Minister wants to rework the exchange of information agreements in tax treaties, a move that will give him greater mobility in cleaning up black money. But tax experts say this is easier said than done. CNBC-TV18' Ashwin Mohan gets you more on the black money controversy. These are trying times for Finance Minister Pranab Mukherjee. The Parliamentary Standing Committee is putting pressure on him to justify the need for non-disclosure clauses in tax treaties. But some experts say that going by recent events, the Standing Committee may want these clauses relaxed or diluted, but India may not have the clout to make that happen. Nihar Jambusaria, National Head - Tax Advisory Services, BDO India said, "If India had the clout, they could have persuaded Swiss government to declare the names upfront and there would not have been postponement." Others feel India may be able to manage some wriggle room. “Corruption threatens the integrity of markets, undermines fair competition, distorts resource allocation, destroys public trust, and undermines the rule of law”- G-20 Summit, Seoul. India is all set to ratify the global convention against corruption seven years after the treaty came into being, taking on an obligation to check corruption in private sector amid the unravelling of multiple scams in the country. India is one of the fourteen countries which had not ratified it out of 140 countries who are signatories to the UN Convention. The government is readying a law to meet the conditions of the United Nations Convention Against Corruption (UNCAC), but independent experts say India is already in a position to ratify the agreement. The proposed law will deal with corruption and bribery in the private sector.